Ginger is a rhizome, a root vegetable that grows underneath the ground. While similar in appearance to other root vegetables, ginger is used as a spice for other foods such as stews and baked goods. It is sold fresh and also dried and ground, and each variety has its use in the kitchen. Fresh ginger looks similar to and can be confused with a Jerusalem artichoke. It has a light brown covering that when peeled reveals a mildly yellow-colored flesh. It can be sliced and pickled, often served as an accompaniment to sushi, or grated and added to various dishes. The fresh form can be frozen for up to six months. It can also be dried and ground to produce a powder that lasts longer, and it's available in the spice section of your supermarket or ethnic store. 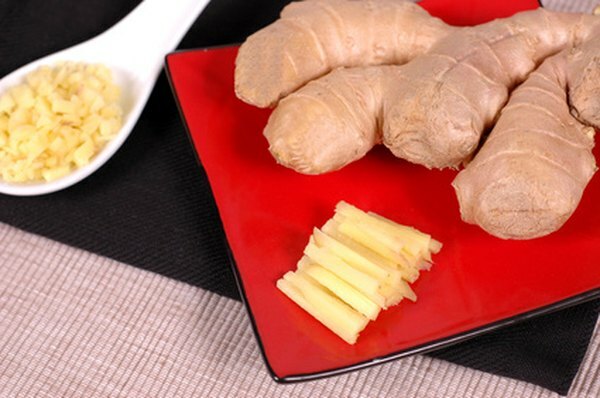 Fresh ginger has a strong flavor that is somewhat diluted by its high moisture content. It can therefore be used for a much wider range of dishes than its ground counterpart, adding subtle depth to various recipes. Ground ginger has been dried to remove all of the moisture and is therefore highly concentrated. An amount of 1 tbsp. of fresh ginger is roughly equivalent to 1/8 tsp. of ground ginger powder, but OChef recommends avoiding any substitution because of the change in flavor. Fresh ginger tends to be much less expensive than ground ginger. However, you need much less ground ginger for recipes, and it can last a long time, making the two somewhat equal in terms of price. As far as fresh vegetables go, fresh ginger is not extremely expensive and little is used per dish, usually only up to 1 tbsp. grated. Fresh ginger is a flavorful addition to many types of dishes. It is a staple in Indian and Asian cooking and can be used in anything from savory meats, poultry and fish to fruited dishes and sweet desserts such as ice cream. Ground ginger is an essential component of various Indian curries and spice mixes and is the main flavor in gingerbread. According to Medline Plus, fresh ginger root is known to have medicinal properties such acting as a digestive aid.